So you want to know 'All about Hawaii?' Well you're in the right place. The following is a accumulation of links throughout our website and across the web that you should find useful for all-things-Hawaii. From history and culture to the flora and fauna, this is the article for anyone looking to learn more about the Aloha State. A few of the 'hot' topics folks seek regarding the islands are the History of Hawaii, the Weather in Hawaii, and both when to visit Hawaii as well as which Hawaiian island(s) to visit when they do come. Additionally, you may be interesting in learning more about the Hawaiian Language and Shaka. Whether you've been to Hawaii a dozen times or if this is your first trip, our articles on 'planning your first Hawaii trip' may prove useful. It provides packing tips, money tips, and additional planning tips you might not have thought about. 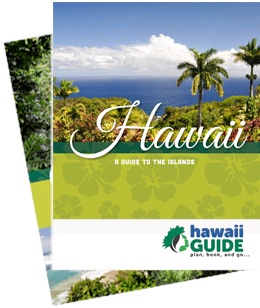 Other articles of interest may include our Hawaii Accommodations Tips and Hawaii Vehicle Rental Tips pages. For those looking to reminisce on their past trips or look ahead to their future trips, we encourage you to take a photo tour using our own Photographs and Pictures of Hawaii. The Hawaiian flag can be seen above to the right. The Hawaiian Goose, the Nene, is an icon in the islands, as are the many endangered honey creepers that live here. The silverswords are also a distinct icon of the islands you'll find no where else on earth. Hawaii music personalities include the late Elvis Presley and recently deceased Don Ho. Many actors and actresses are also well known because of their appearances in movies filmed in the islands, such as Jurassic Park and Indiana Jones. If you're looking to learn more about the lifestyle and the language of Hawaii, the following will provide a brief introduction to these topics. There are a lot of great things about Hawai'i. There are all the unique places, beautiful scenery, smells, beaches, hikes, and oh yes, most of all, the people. If you visit Hawai'i and don't feel at home, you must be doing something wrong because Hawai'i has the most friendly people in the whole country. And given that we are originally from the South, that's saying a lot because most folks from the South think they are THE friendliest. We did too, until we stepped foot on Hawai'i for the first time. People smile here, a lot, and they are happy. Strangers say "hello" when they pass each other, and politeness has been a hallmark of the island's identity for years. Heard something different? Here's the dose of reality we feel obligated to provide. In modern times, you're bound to hear all sorts of different stories about experiences in Hawai'i. In the last few years Hawai'i has come under the strain of its heavy tourism. And with such a small geographic area, conflicts between visitor and resident are bound to arise. Our advice is to treat Hawai'i like you would any other location you are a guest. Show aloha (in the true sense of the word) and you'll find it given in return. A lot of folks come to Hawai'i today with the "Disneyland" mentality. This typically is what causes the conflicts to occur. This is especially true in the form of private property trespassing due to visitor exploration. Without preaching, just keep in mind Hawai'i isn't a theme park and it's not all public. In fact, many public places neighbor private ones. Just be mindful of where you're exploring and obey all private property signs. You'll be on the right track to avoiding any conflict with residents. And if you should experience any negative-vibes or stink-eye (ugly looks) from someone for no apparent reason, just forget about it. The vast majority of folks here are the nicest we've ever met. Don't let a bad apple spoil the barrel. Aloha is still alive and well here, make no mistake about it. Help be a part of preserving it and show your own Aloha everywhere you go.